Not "every beautiful blonde person" is a Russian agent, Papadopoulos said. The wife of a one-time Trump adviser who was sentenced Friday for lying to federal investigators acknowledged that special counsel Robert Mueller’s team suspected she may have been a Russian spy. Simona Mangiante Papadopoulos, wife of former Trump campaign foreign policy aide George Papadopoulos, said in an exclusive live interview with her husband on “This Week” Sunday that her international political background raised “a red flag” for U.S. investigators. 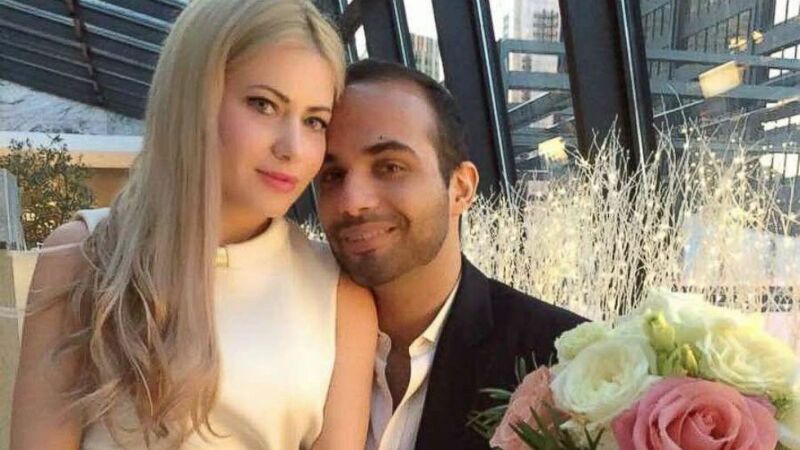 (Obtained by ABC News) George Papadopoulos married Simona Mangiante in Chicago, March 2, 2018. She added that she understands their concern about her role as it relates to her husband, but has denied that she has any ties to Russia. “Of course this connection was highly suspicious. I respect the, I always said I respect Mueller’s interest in my profile because clearly it’s quite alarming, the fact that I marry George Papadopoulos in the middle of this storm,” Mangiante Papadopoulos said. The couple married in March of this year. They met through Joseph Mifsud, a mysterious Maltese professor who is believed to be an operative for the Russian government and who attempted during the campaign to introduce George Papadopoulos to people purportedly connected to Russia. 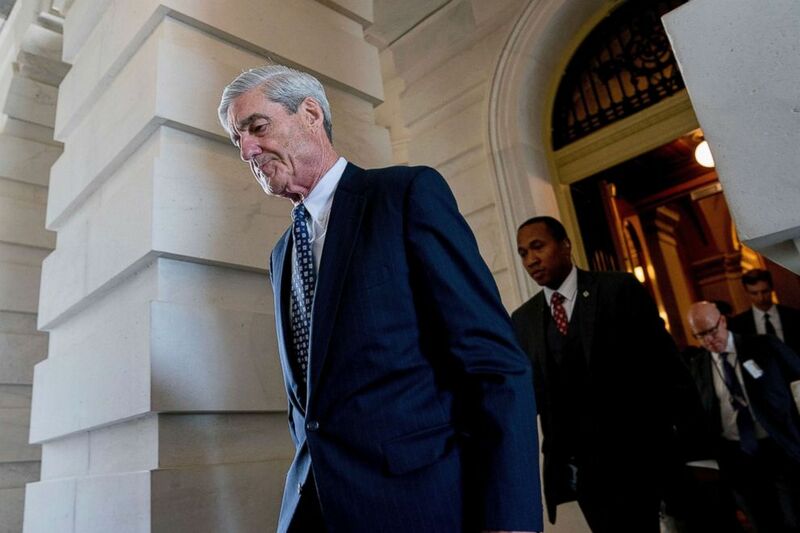 (Andrew Harnik/AP, FILE) Former FBI Director Robert Mueller, the special counsel probing Russian interference in the 2016 election, departs Capitol Hill following a closed door meeting, June 21, 2017. Stephanopoulos asked the couple about a Democratic National Committee lawsuit suggesting that Mifsud might be dead. The DNC -- which is suing Russia, the Trump campaign and WikiLeaks for interfering in the 2016 election -- said in a court filing Friday that it believes all the defendants in the case have been served with the complaint, “with the exception of Mifsud (who is missing and may be deceased),” Bloomberg reported. "Do you know anything about that?" Stephanopoulos asked. "As far as you know, he’s missing and it’s possible?" "It’s possible, yes," Mangiante Papadopoulos said. Her husband said, "I have no idea, George. But it’s possible." Papadopoulos said even his family was concerned about his romantic relationship and suspected his wife was a Russian spy. Papadopoulos’s comments on “This Week” were his first in public since being sentenced Friday to 14 days incarceration, one year of supervised release, 200 hours of community service and a $9,500 fine. He pleaded guilty in October to making false statements to FBI agents about his interactions with a Russian national and the Maltese professor. 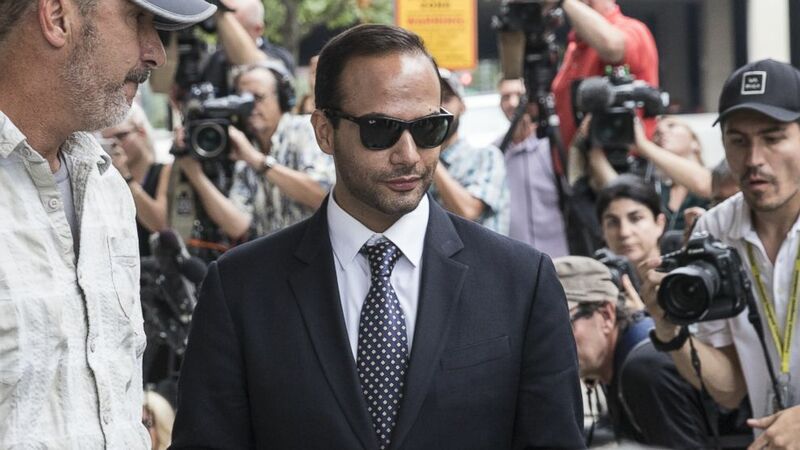 (Alex Wroblewski/Getty Images) Former Trump Campaign aide George Papadopoulos leaves the U.S. District Court after his sentencing hearing, Sept. 7, 2018, in Washington, D.C.
After the judge issued the sentence Friday, Papadopoulos stepped away from the defense table and paused in a long embrace with his wife. A lawyer by training, she had become his public spokeswoman during the long months between his arrest and his sentencing. While Papadopoulos still must surrender himself and serve the two-week prison stint, he is already looking beyond it and planning a move to California to begin his new life supporting his wife’s fledgling acting career. But he may not be entirely finished with the investigations that led him to prison. “As an influential foreign policy adviser to the Trump campaign, Mr. Papadopoulos was informed that Russia had ‘dirt’ on Hillary Clinton in the form of ‘thousands of emails’ at a critical time during the campaign,” Warner said. “I still have significant questions about how high that information went, and I know the Senate Intelligence Committee would like to hear directly from Mr. Papadopoulos."